Please welcome Wendy and Cheryl, two teachers passionate about engineering with kids. I am sure you’ll enjoy this helpful post as much as I did! STEM, Engineering, 21st Century Skills…the buzzwords of the 2013-2014 school year. With all that is on a teacher’s plate this autumn, what can seem, in isolation, like an interesting and intriguing idea often ends up lost in the shuffle of a million demands for the school year. Where can I fit this in? How can I engage my school’s community into this topic? What can I do to persuade its importance to my staff? We have discovered over the past three years that the first and best step towards capturing a school’s interest in STEM is to hold a Family Engineering event. We have found it to be the ultimate public relations experience…and it is a whole lot of fun! Our Family Engineering Night is an event at which families come together to explore engineering with engaging, hands-on activities. As part of our integrated engineering program, our school hosts an annual Family Engineering Night each winter. It is one of the most eagerly anticipated school events of the year, as over 600 people participate. Families join together to explore engineering by solving problems together. It provides children an opportunity to further explore and learn about the field of engineering with the most significant adults in their life – parents, siblings, and grandparents. The parents are given an opportunity to actively participate in their child’s learning. It’s an exciting evening for all! At Family Engineering Night, it’s all about jumping right in! Moms, dads, grandparents, and students begin exploring fun engineering concepts as soon as they walk in the door. More than two dozen independent activities fill the cafeteria. Families move from one to the next exploring specific engineering concepts that connect them to real world applications. From launching a weighted paper cup down a zip line, to “mining” a chocolate chip cookie, to loading pennies in a small foil boat, families must think like engineers to tackle problems. The pace is unhurried because it’s all about having fun and learning new things. Volunteers are available to answer questions and to offer assistance and encouragement. Longer and more in-depth engineering challenges are also available in other parts of the school. 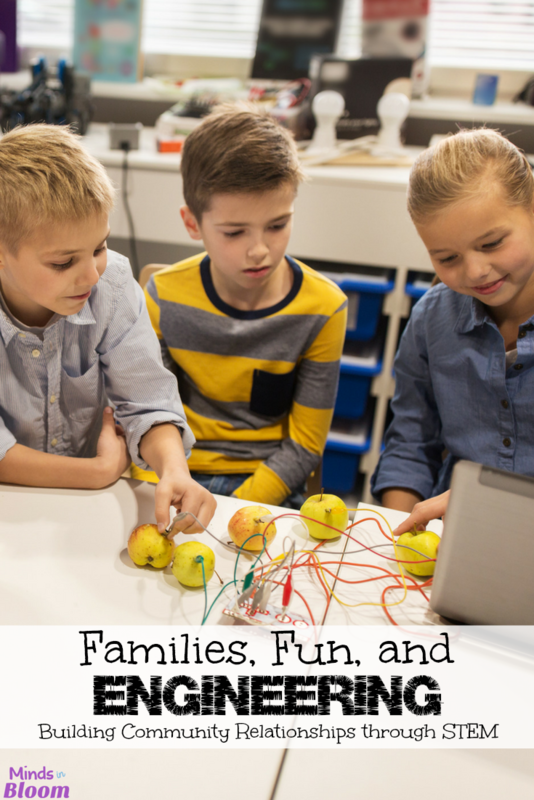 These activities engage families in the full engineering process. Working together as a team, families design, build, and test a device used to solve a real life problem like designing a robotic hand using popsicle sticks, building a wind-powered car out of index cards and straws, or creating a rocket launcher from a water bottle. Testing, failure, perseverance, and retesting are part of the engineering challenge. Yet, so is fun, as smiling families work together, inspire each other, and achieve success! Family Engineering Night is not just an effort of the school staff and administration. Volunteers are local high school students, engineering students from a nearby university, local Einstein fellows, members of professional engineering associations, engineers that live in the community, as well as community moms and dads willing to lend a hand. All come together with the goal of providing a unique learning experience for not only students but their families, as well. There are some terrific resources available for ideas, but the very best reference tool available is a manual published by the Family Science Organization in Portland, Oregon. Their book, called Family Engineering, is filled with “how to” instructions, ready-to-copy lessons, and everything you need to plan your own engineering night. You can even order laminated center charts with directions and clips to support them. Most of the activities require simple recycled materials, such as empty toilet paper rolls or empty water bottles. Generally, other needed materials are low cost and easy to obtain, from popsicle sticks to foil to rubber bands and paper cups. An engineering night does take significant planning and prep time in advance, but it is worth every minute. It has not only become the most anticipated annual family event at our school, but it also has provided the foundation for developing our school-wide engineering program and for building strong community relationships. Together, Cheryl Nelson and Wendy Goldfein bring a total of 46 years of teaching experience in kindergarten through seventh grade. They have taught gifted and special needs students, as well as English Language Learners. Currently teaching 4th grade, Wendy and Cheryl have developed an integrated engineering curriculum at their school, encompassing grades K-6. Wendy has achieved National Board Certification and is the recipient of the National Science Foundation’s Presidential Award for Excellence in Mathematics and Science Teaching. Cheryl and Wendy are the recipients of numerous STEM grants to fund their school’s engineering program. They were recently published in NSTA’s Science and Children journal, and they regularly present at state and national science and STEM conventions. Thank you for this wonderful opportunity to guest blog on Minds in Bloom! We are delighted that we were able to share about Family Engineering Night with your followers. You all are cordially invited to visit our website for more ideas and resources on STEM.